Labels Albany, Louisiana - 'A shipping point of some note' in 1860. 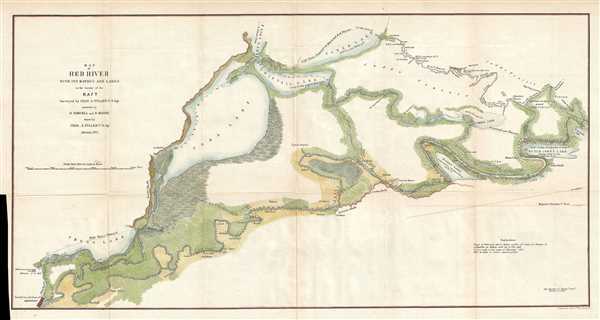 Map of Red River with its Bayous and Lakes in the vicinity of the Raft. This is a large 1855 Land Survey map following the course of the Red River from Shreveport, Louisiana to its confluence with the Red Bayou. It was drawn by Charles A. Fuller to illustrate his travels on and inspection of the Red River. Using a simple raft, Fuller left Schreveport and began mapping the river in considerable detail with the expectation that various improvements intended to facilitate river commerce would follow. Numerous land holders along the river are identified as well as adjacent rivers and lakes that could be used to bypass the main river artery. This is also the first appearance on any map of Albany (no longer extant) Louisiana. According to the Tourist's Description of Louisiana in 1860, Albany was a 'shipping point of some note' on Soda Lake. This map was drawn by Charles A. Fuller and engraved by Ackerman of Brooklyn, New York, for issue in the 1856 congressional report, Maps and Views to Accompany Message and Documents 1855-56. Bagur, J., A History of Navigation on Cypress Bayou and the Lakes, p. 201.